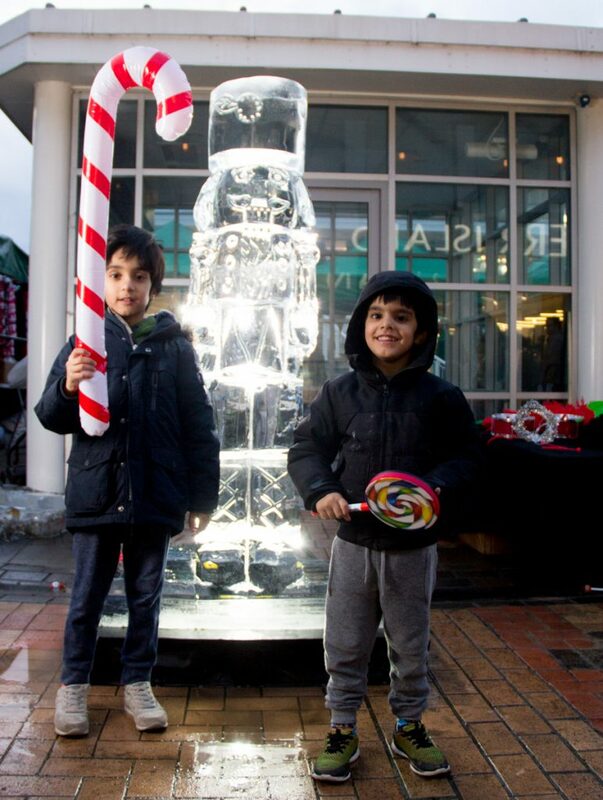 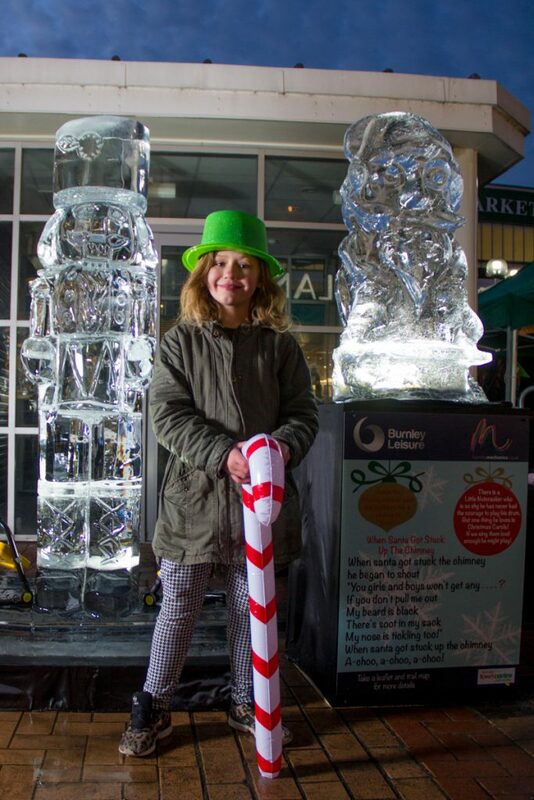 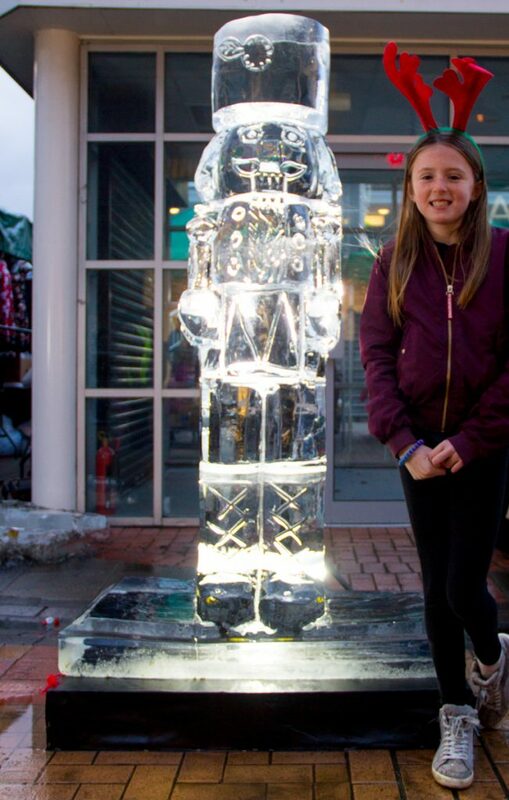 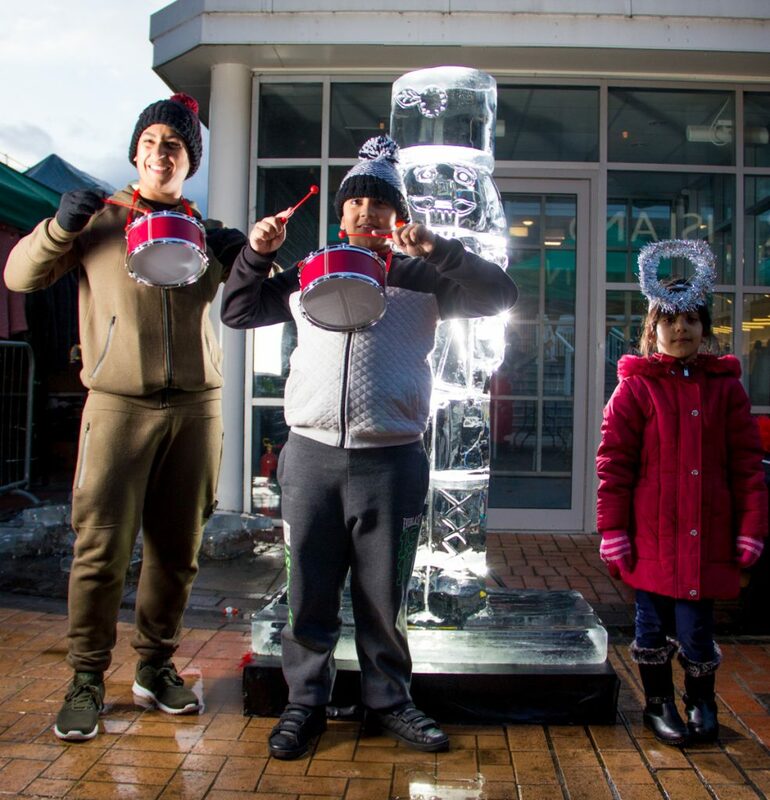 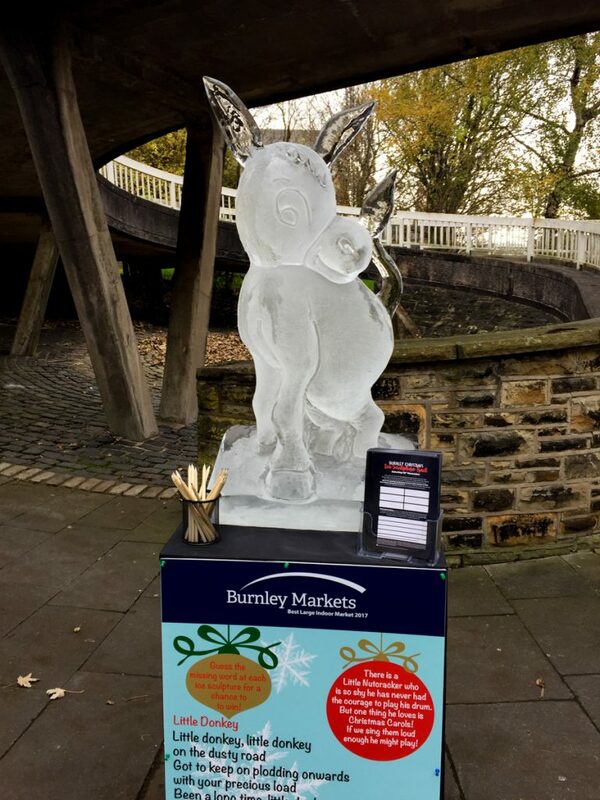 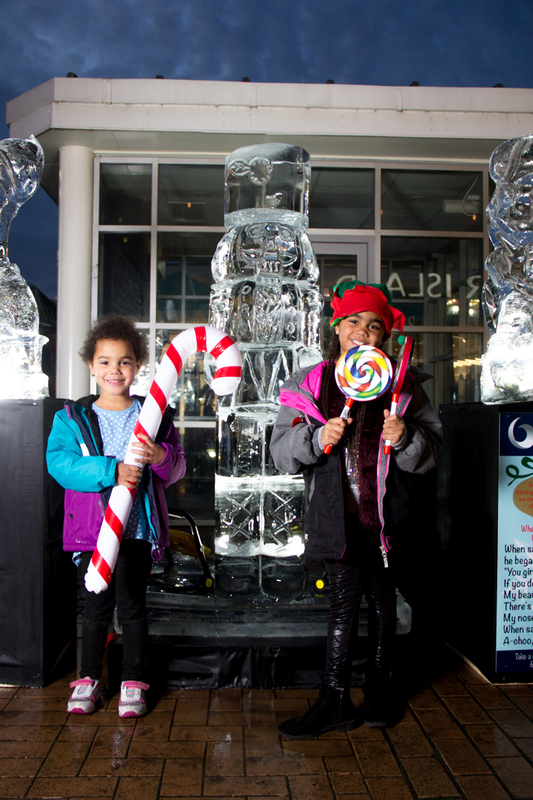 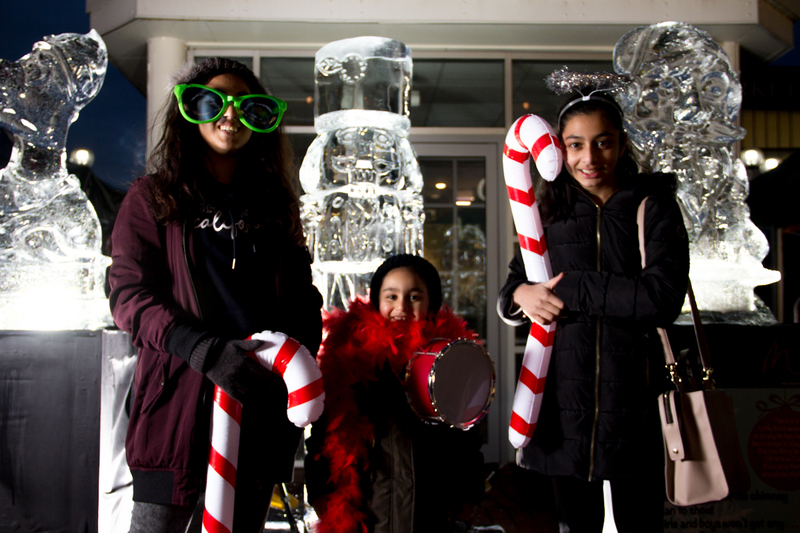 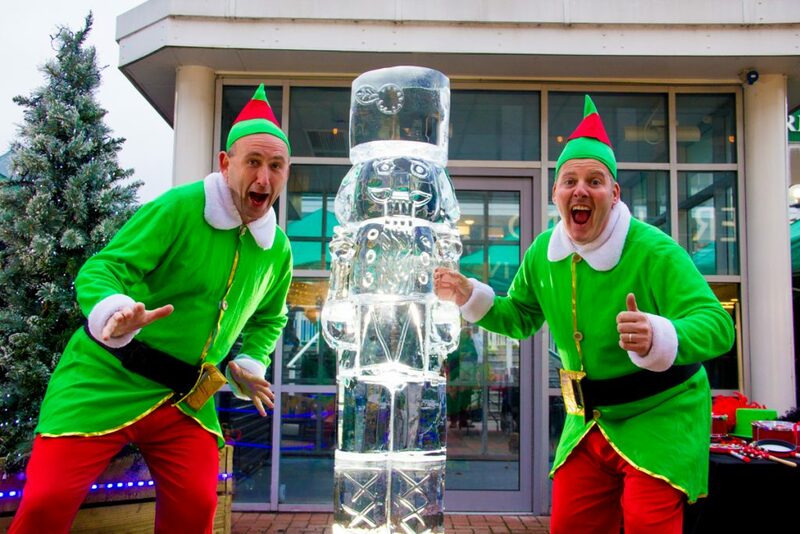 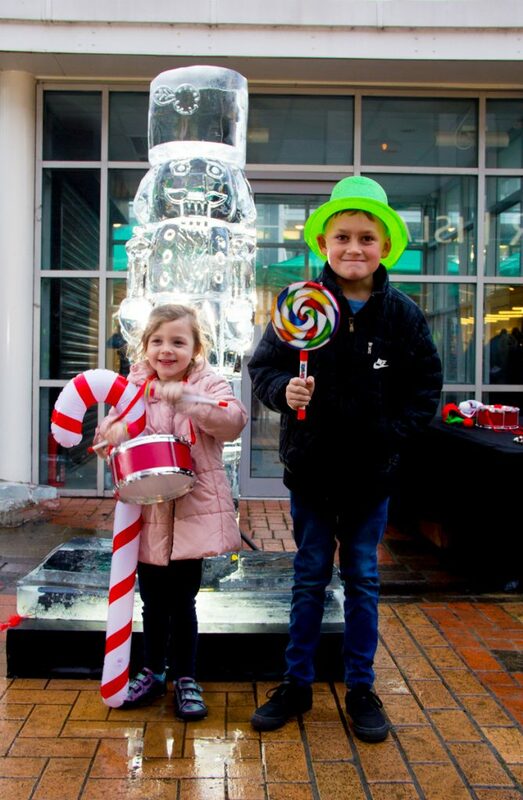 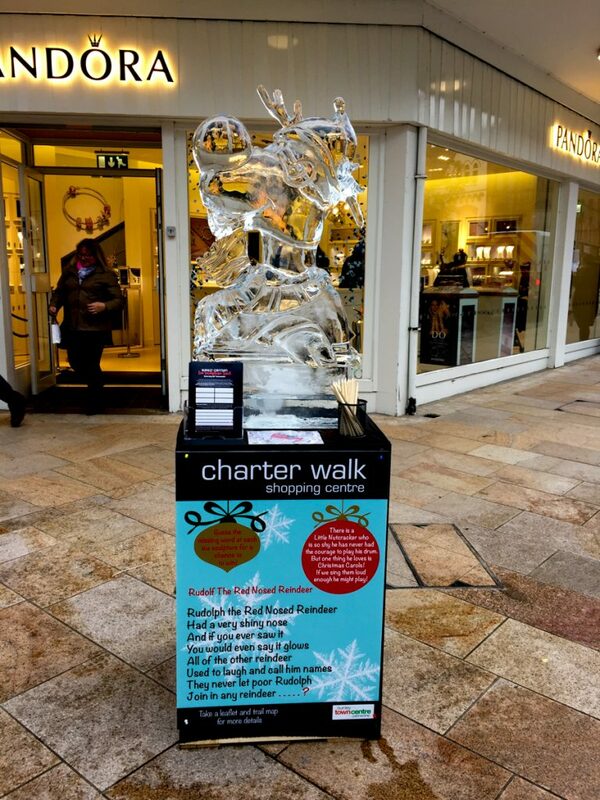 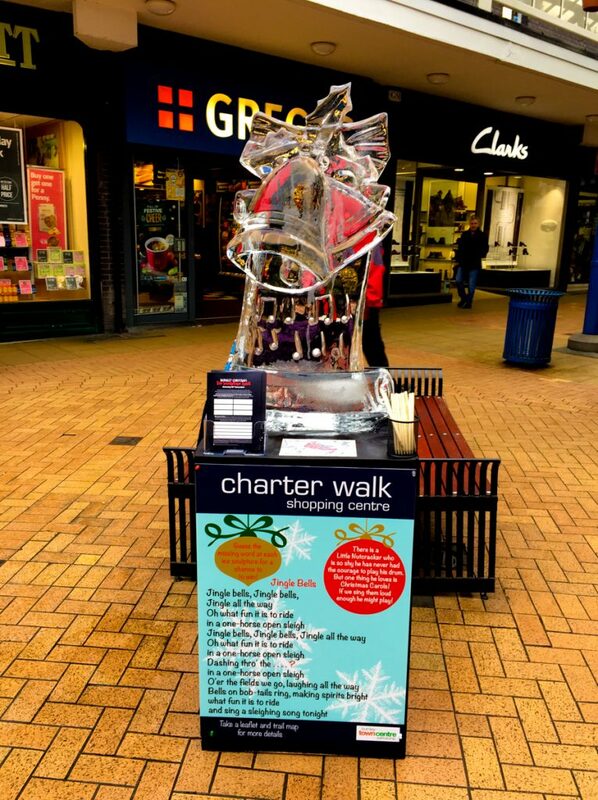 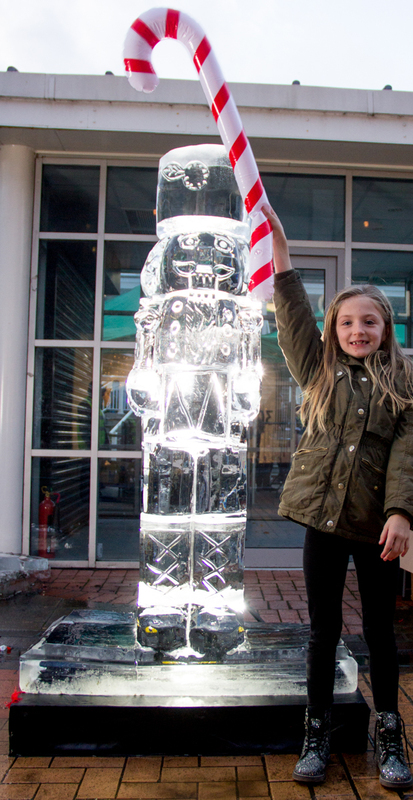 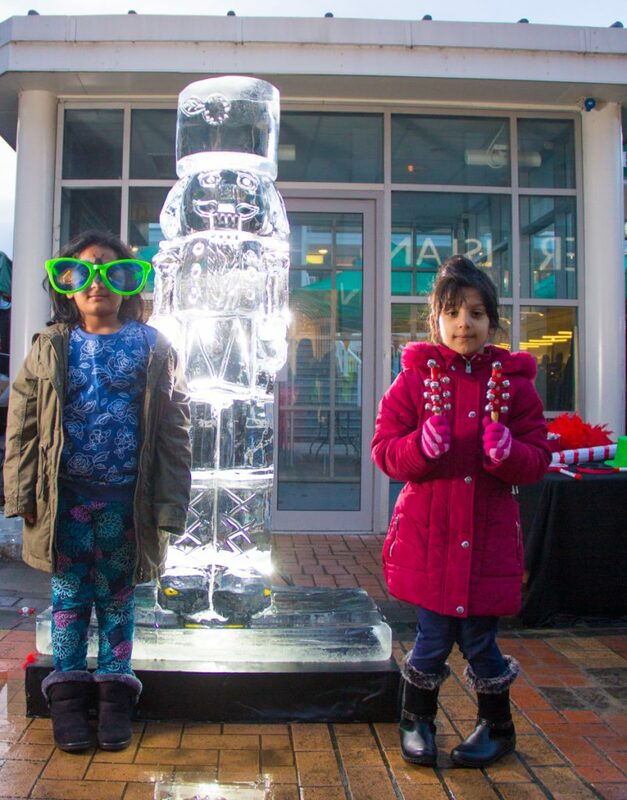 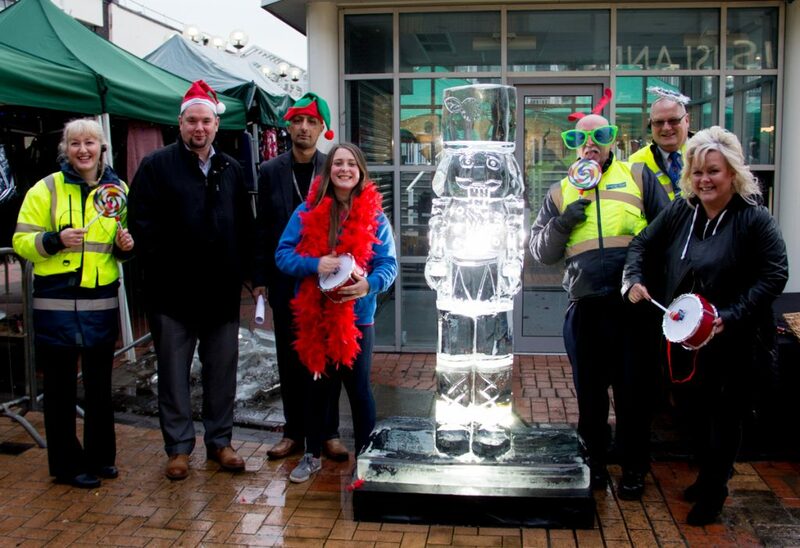 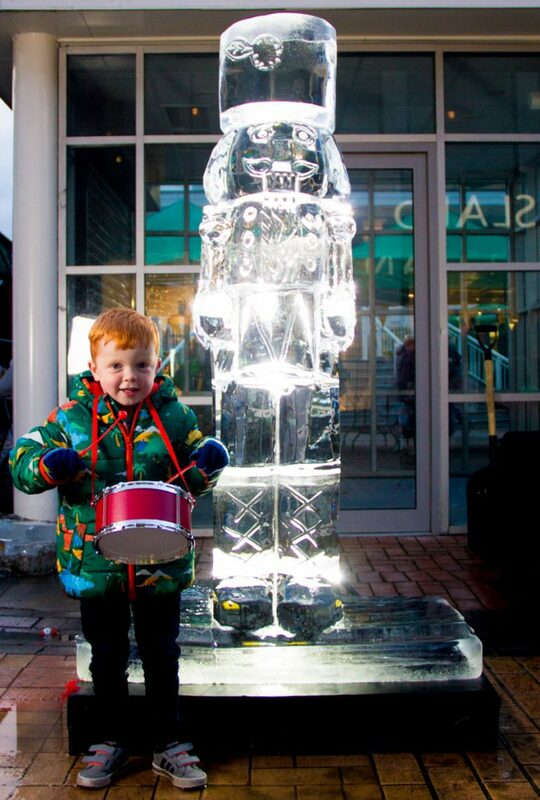 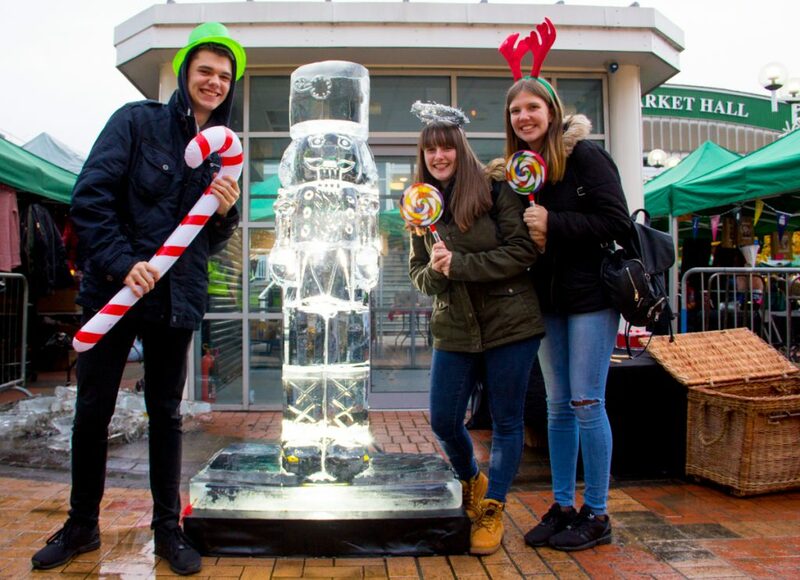 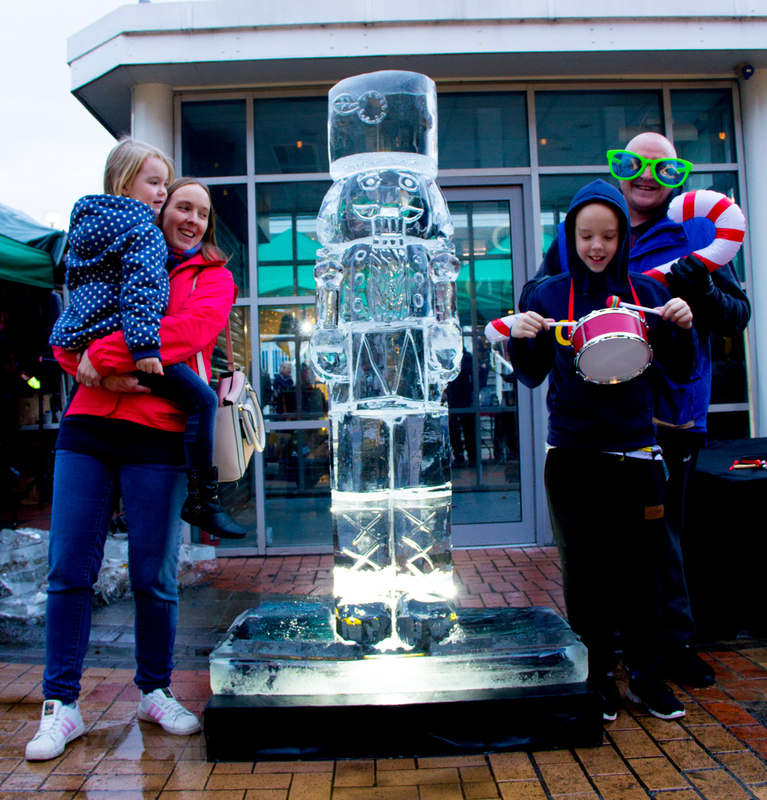 Burnley Town Council invited us along to their weekend of Christmas events to create an ice sculpture trail and we were delighted. 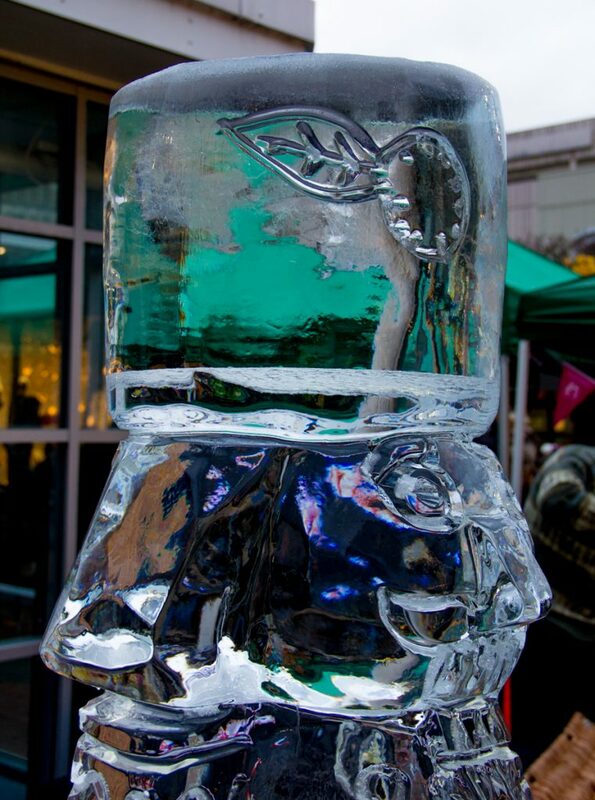 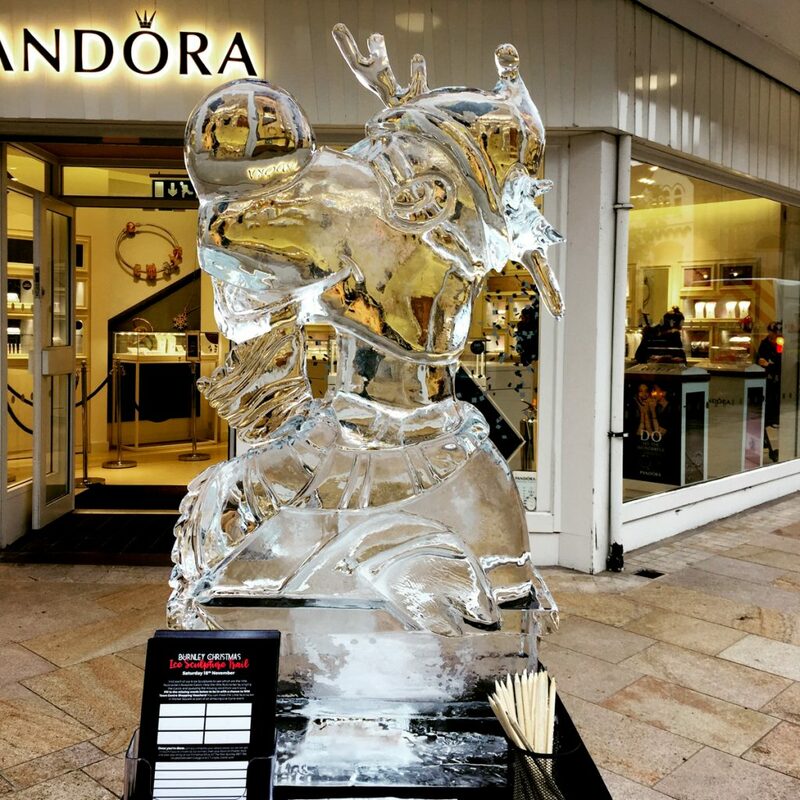 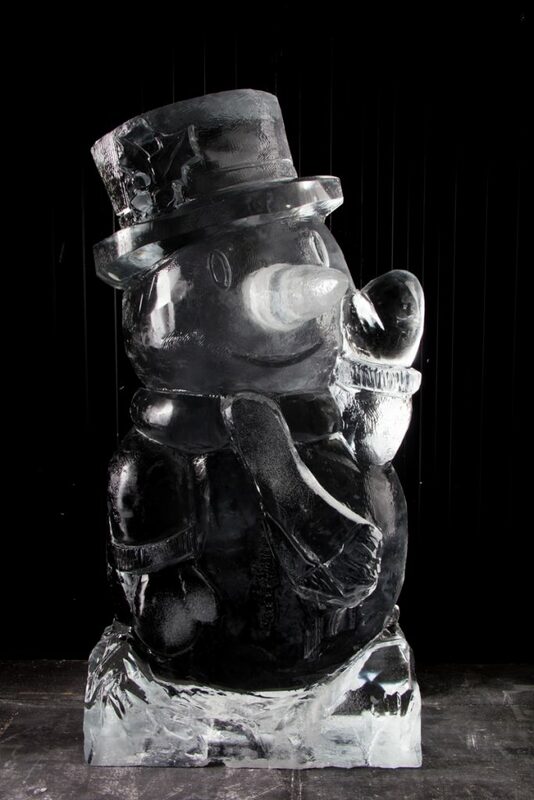 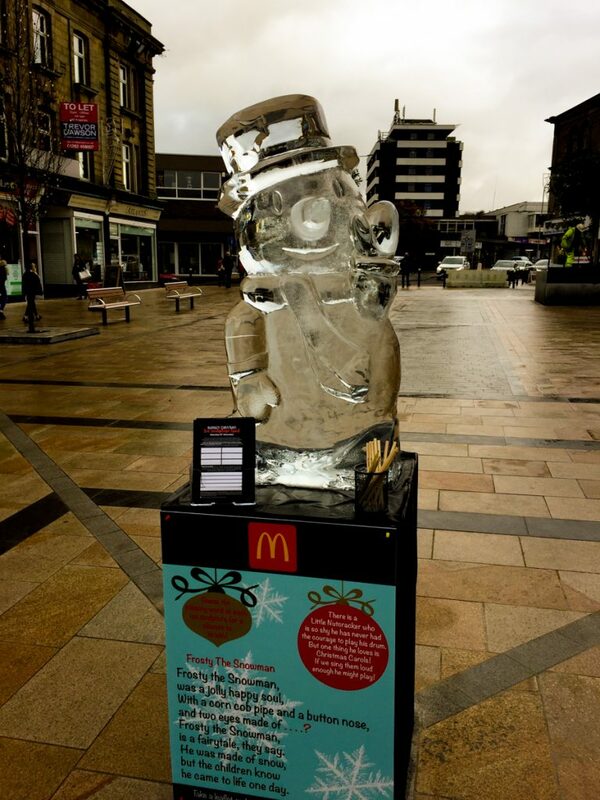 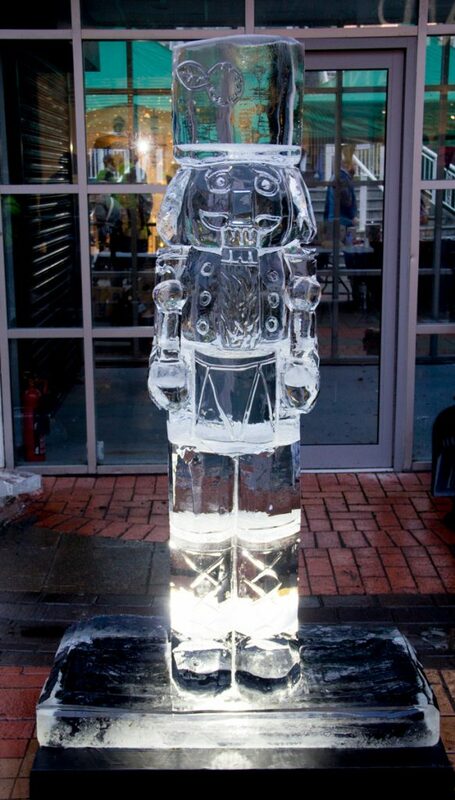 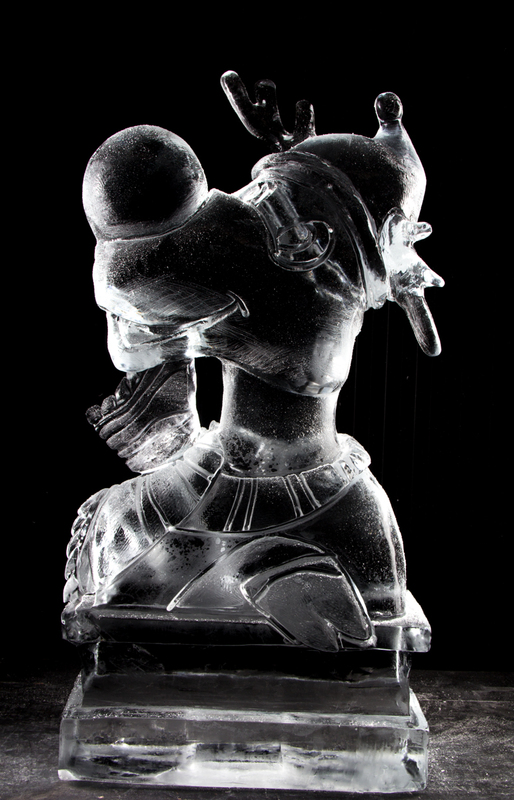 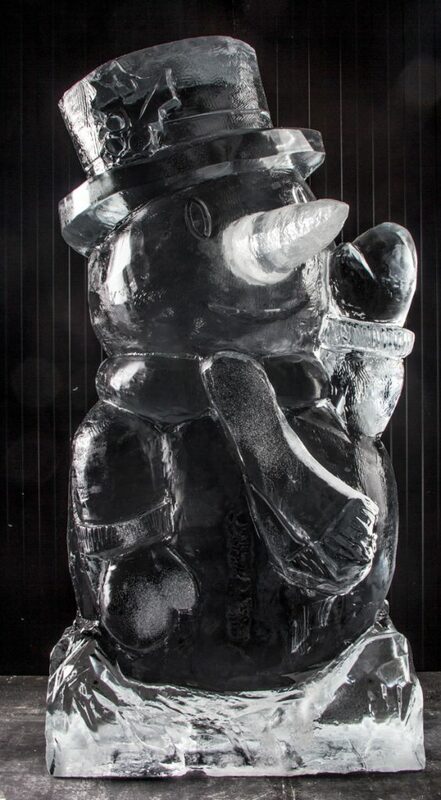 We created 6 ice sculptures which were dotted all over town. 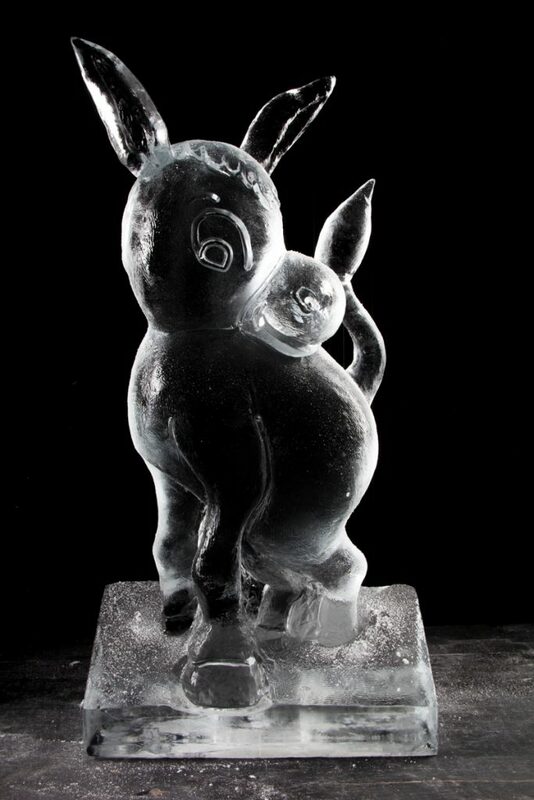 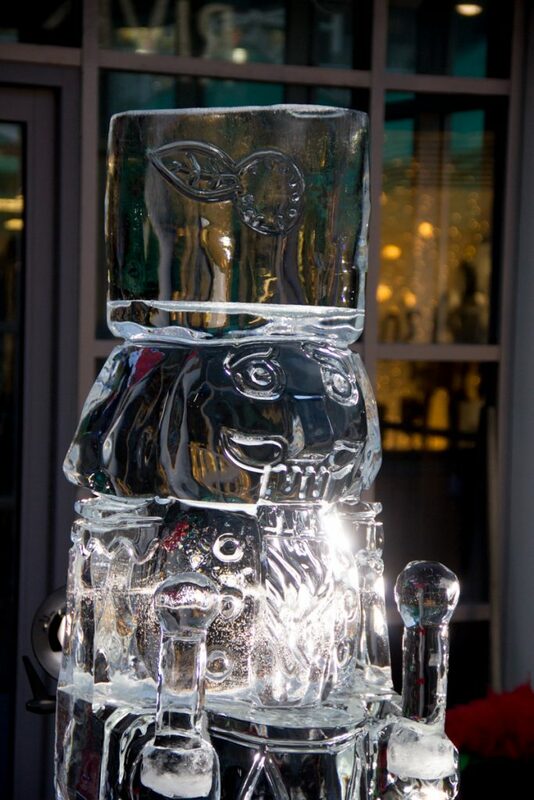 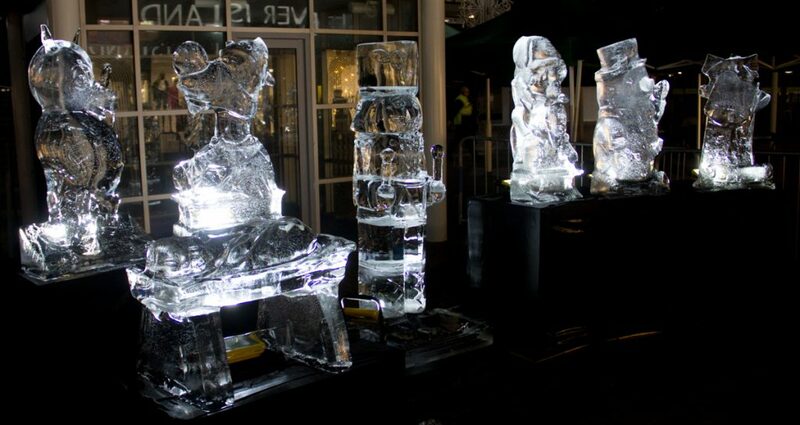 Each ice carving was from a famous Christmas song. 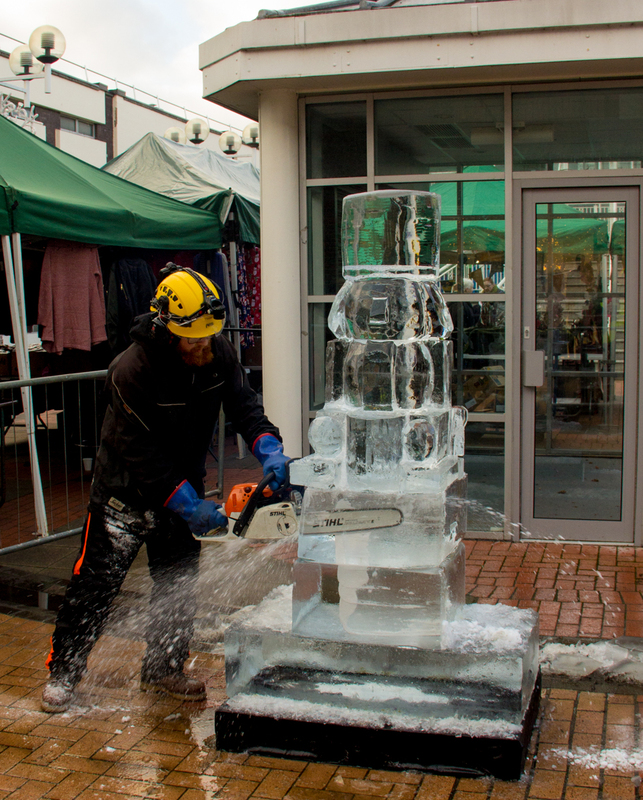 The theme of the trail ended with live ice sculpting by Sand In Your Eye’s very own Jamie Wardley who created a nutcracker during the day from ice. 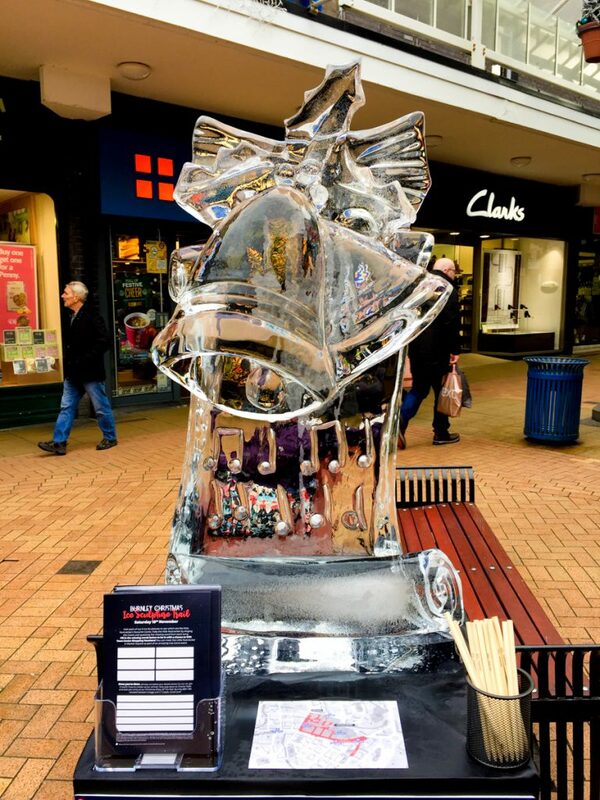 The story was…. 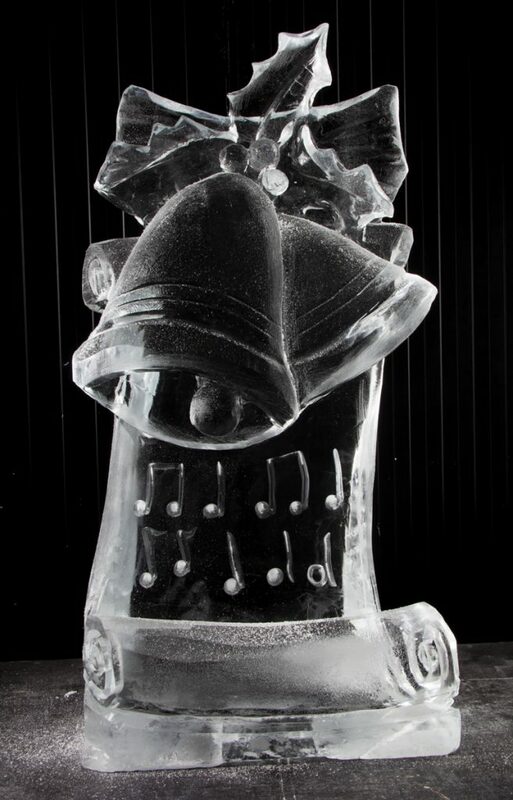 There is a Little Nutcracker who is so shy he has never had the courage to play his drum. But one thing he loves is Christmas Carols! 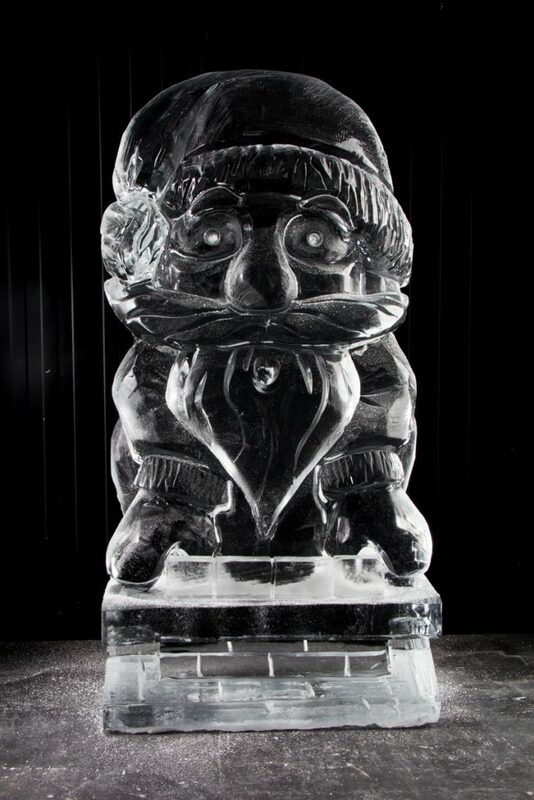 If we sing them loud enough he might play! 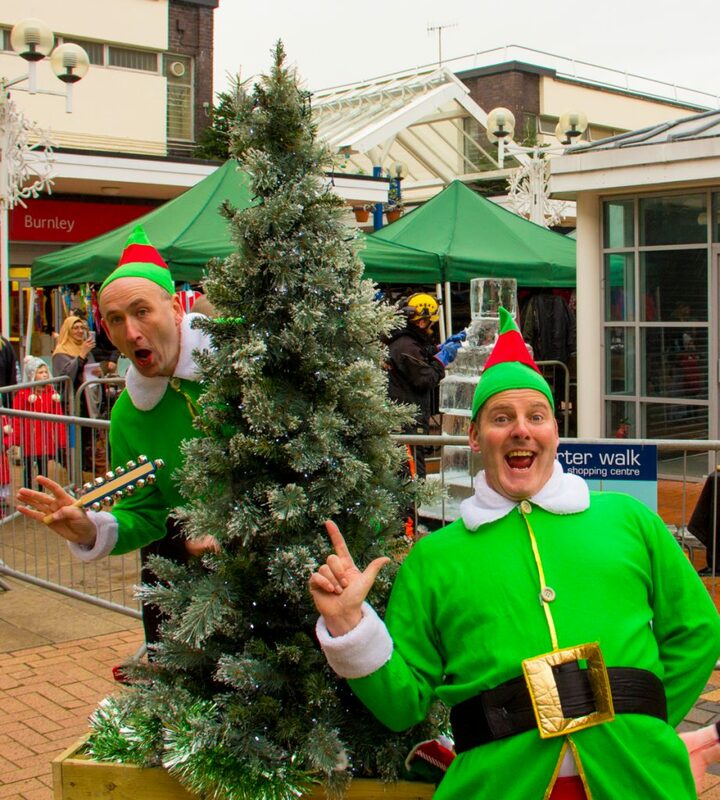 Because we sang so loud (even if it was in your head! 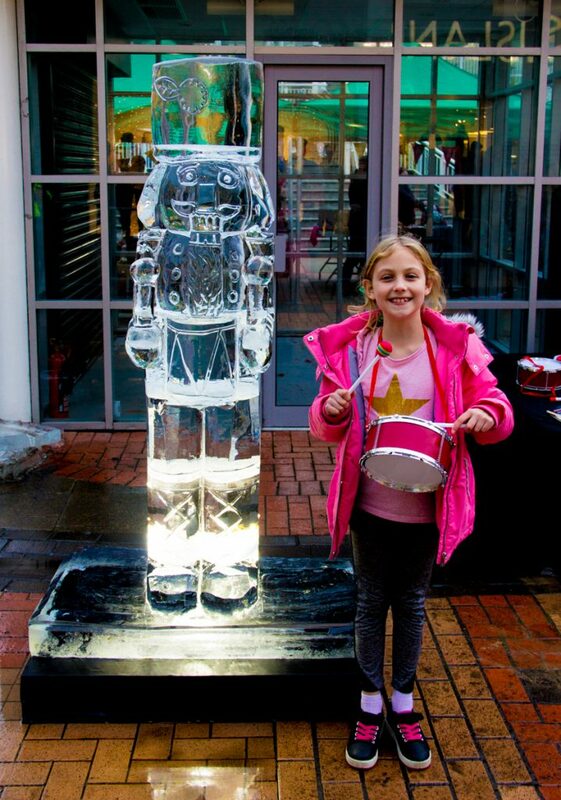 ), the little Nutcracker has found the courage to play his drum again! 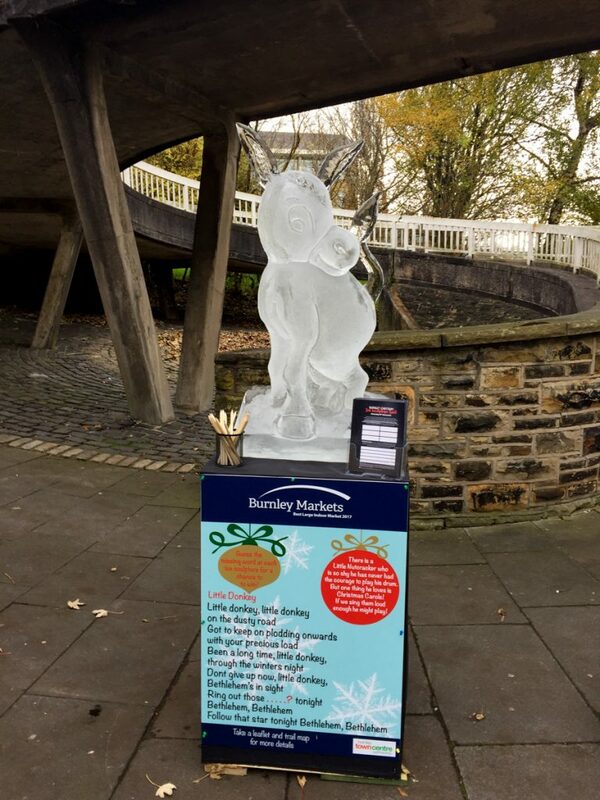 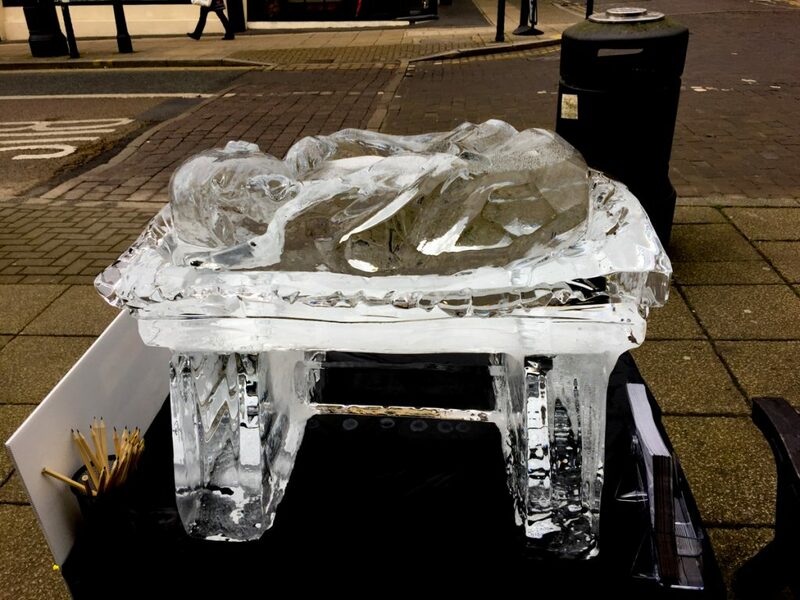 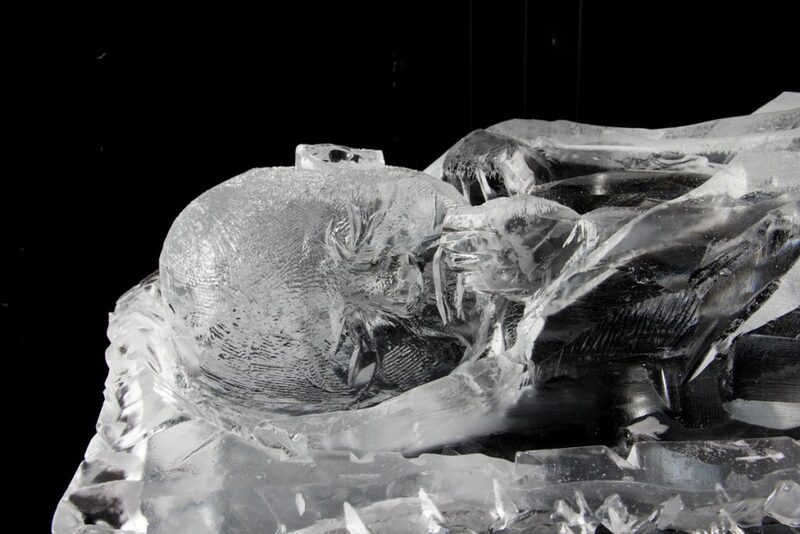 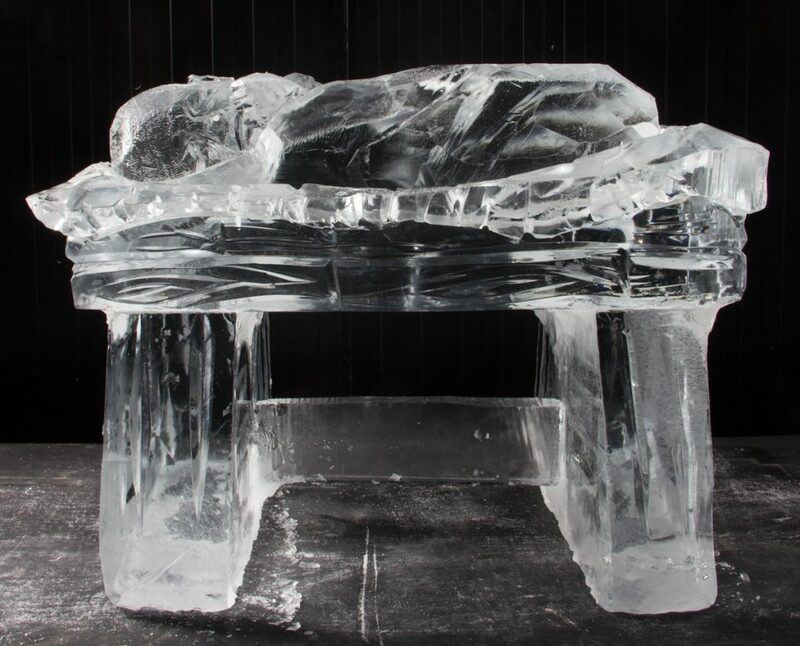 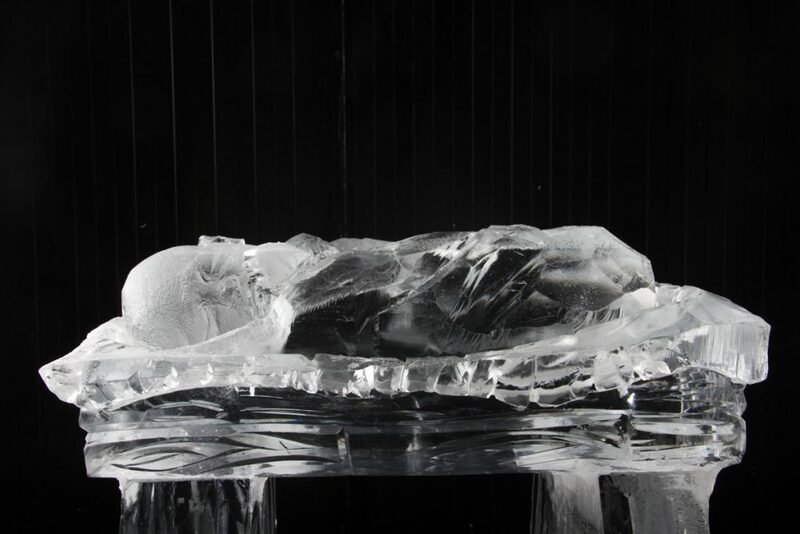 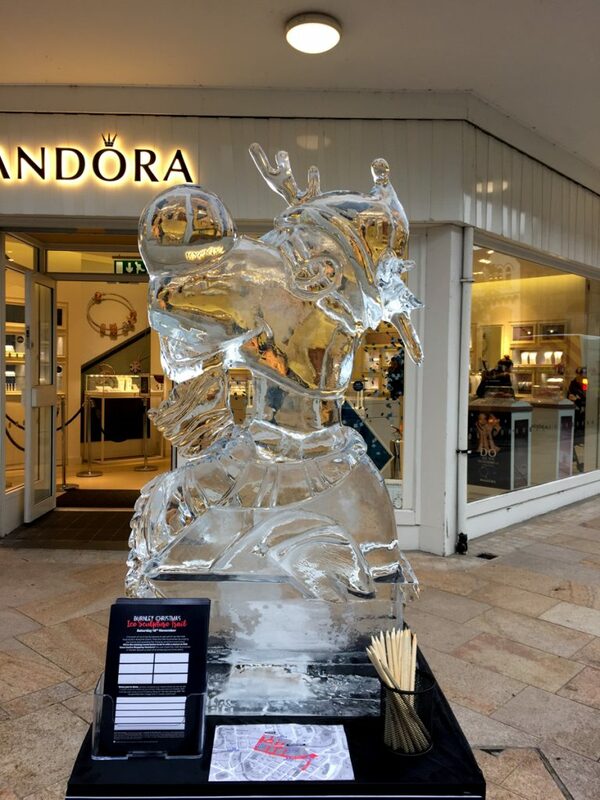 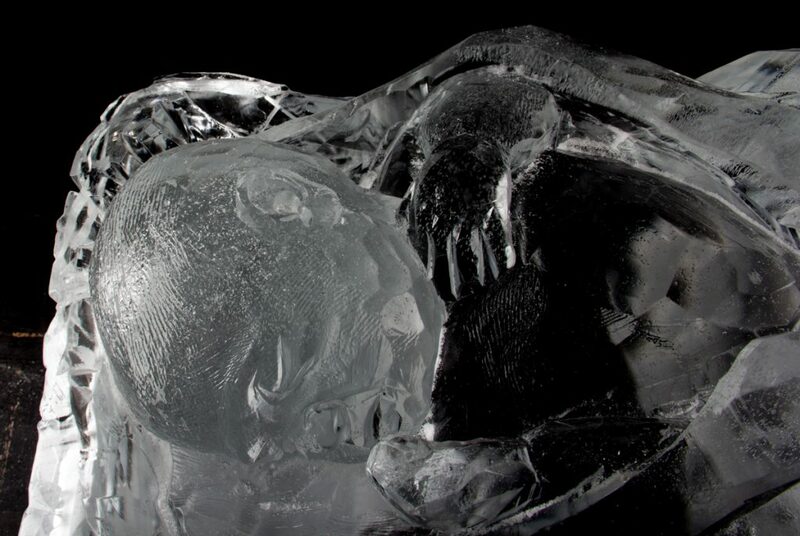 The six pre carved ice sculptures on the trail were created in our ice studio in Hebden Bridge Yorkshire, by ice carvers, Claire Jamieson, Rodrigo Ferreira, Richard Spence and Jamie Wardley. 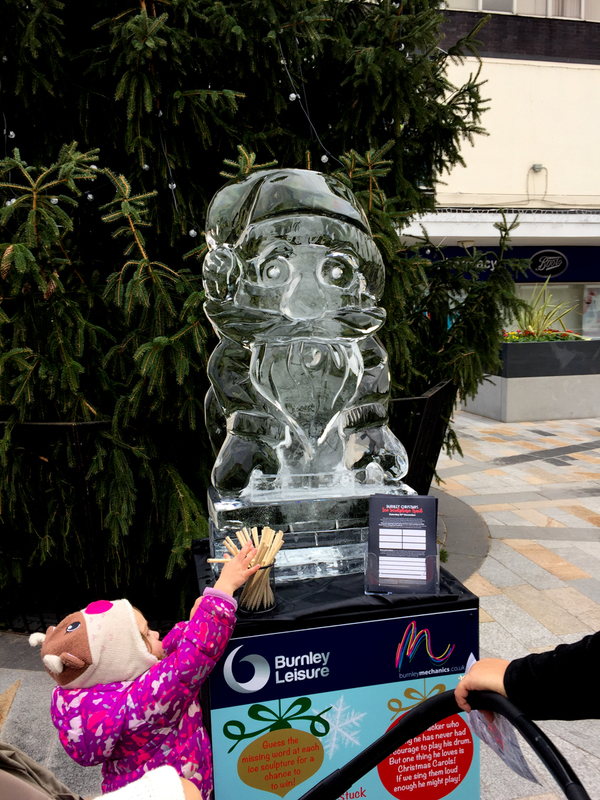 On the day Jamie, Claire Rich, joined by James headed over to Burnley to deliver the sculptures and set up for a day ice sculpture fun! 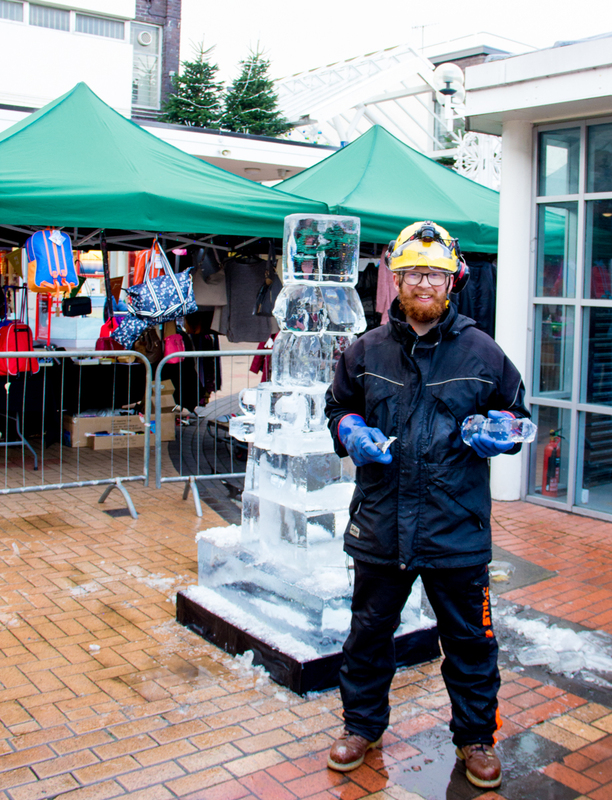 James and Rich carefully unloaded all of the ice sculptures and displayed them around the town, while Jamie and Claire cut and stacked the ice ready for the live carve. 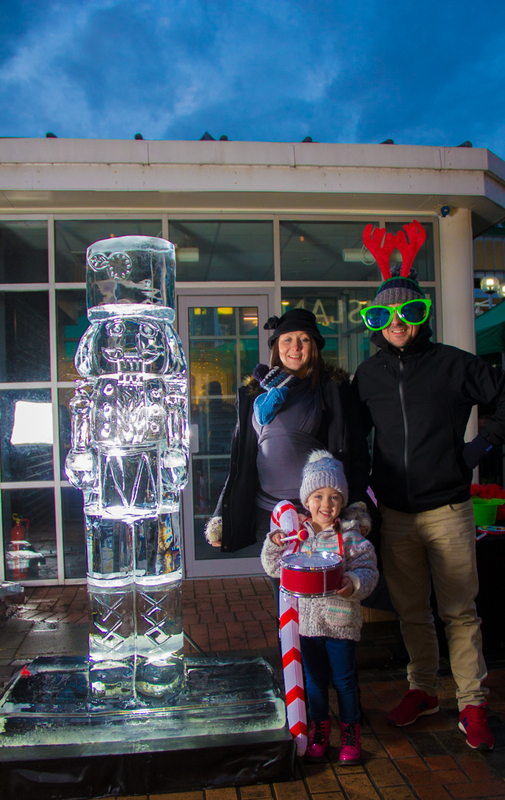 Lots of people turned out to watch Jamie bring the nutcracker to life and joined in with some carols, dress up and had their photo taken with the finished result. 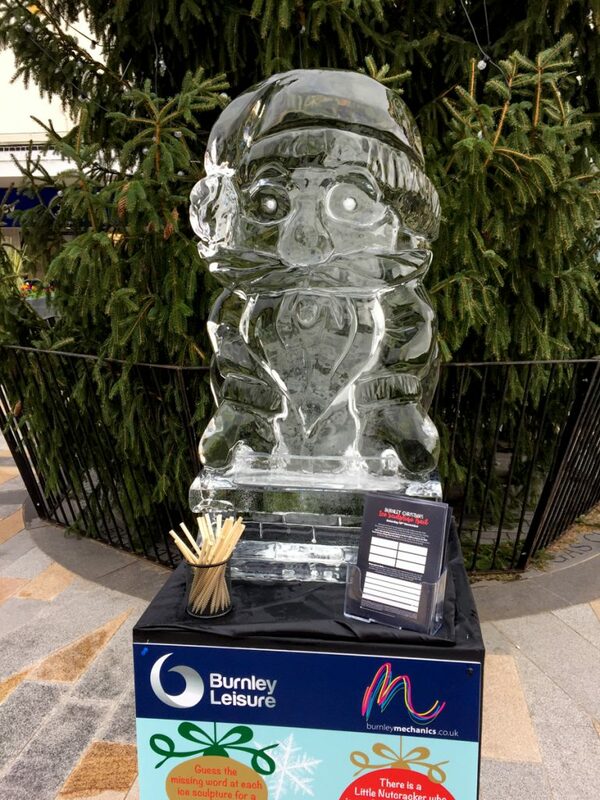 Thank you to Burnley Council for such a great day! 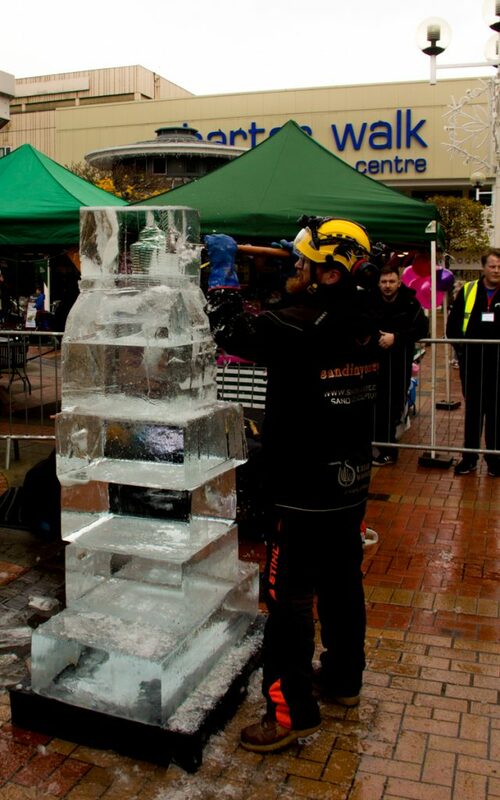 Have a look at some photos from the day. 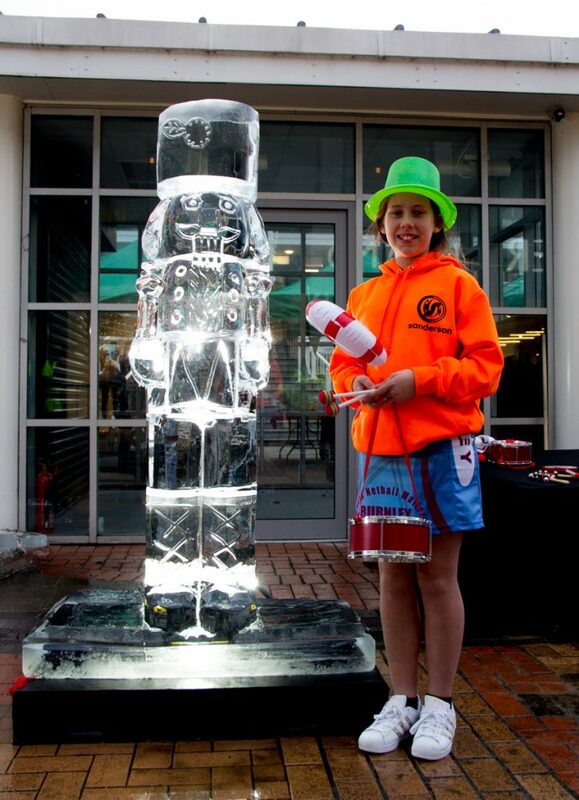 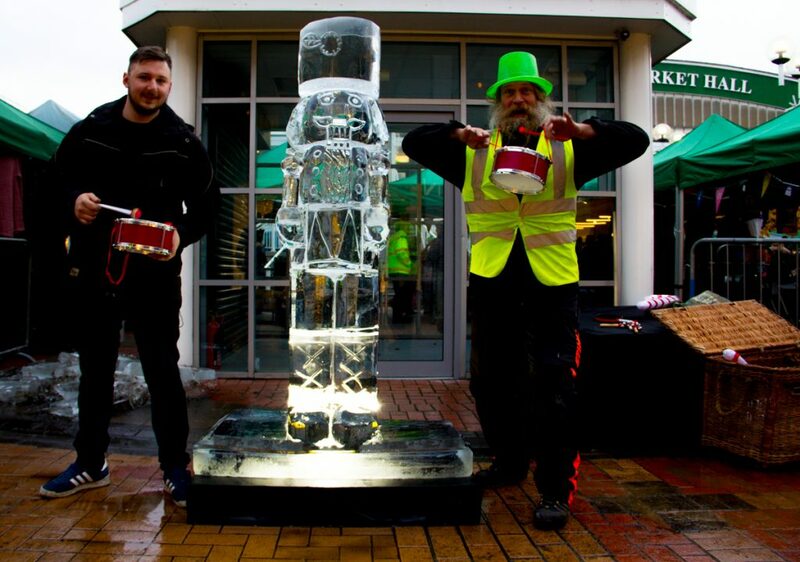 Drummers and Angel having fun at the ice sculpture event. 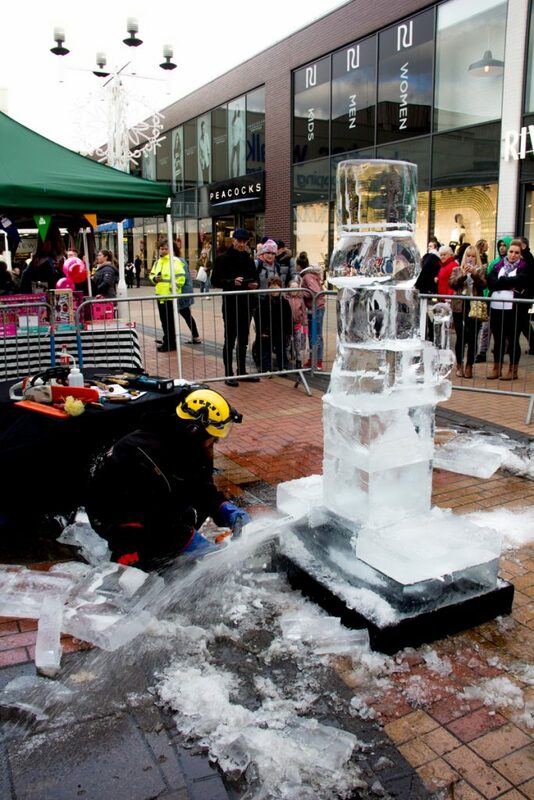 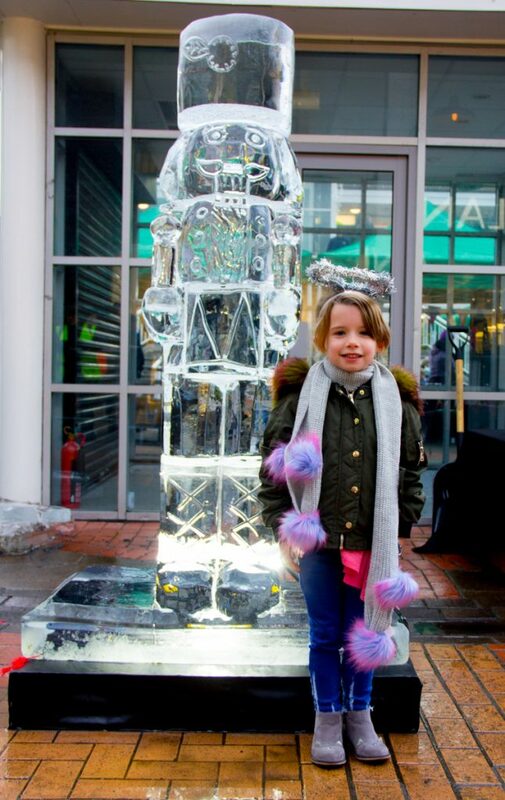 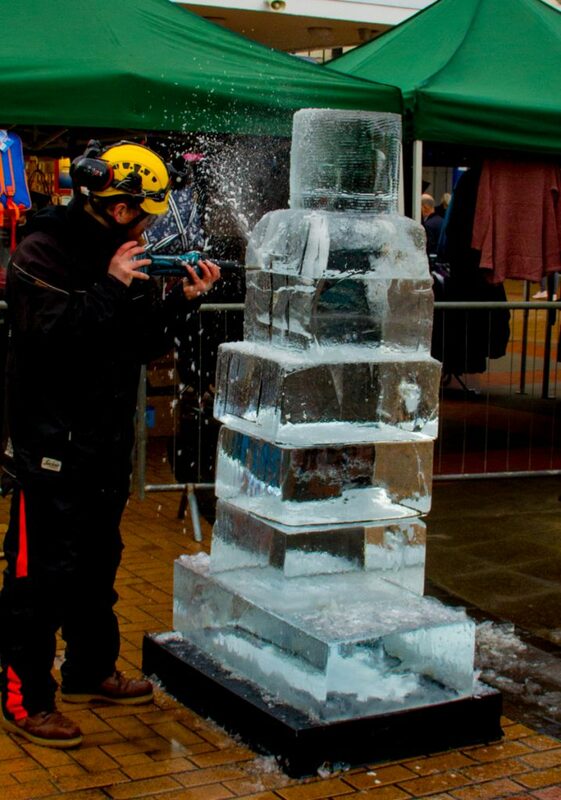 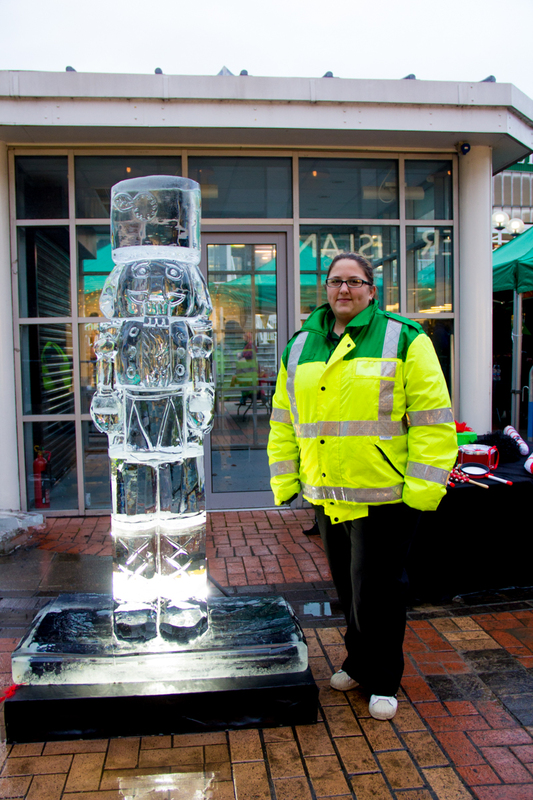 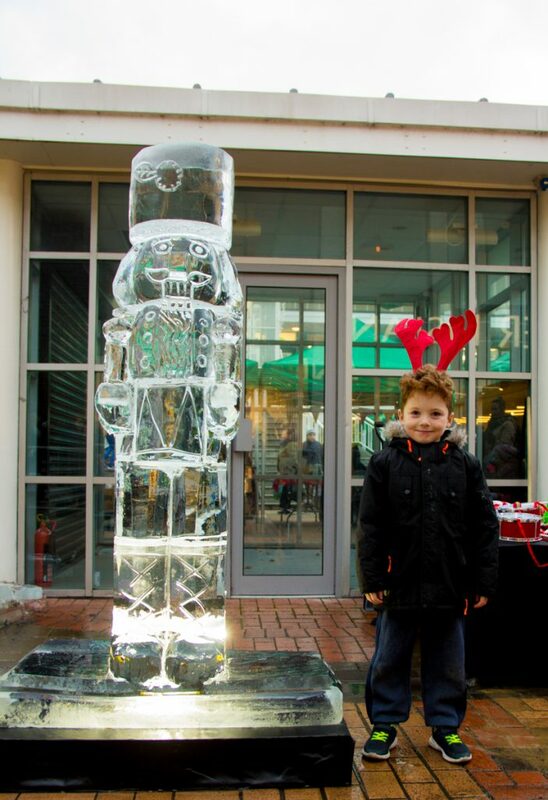 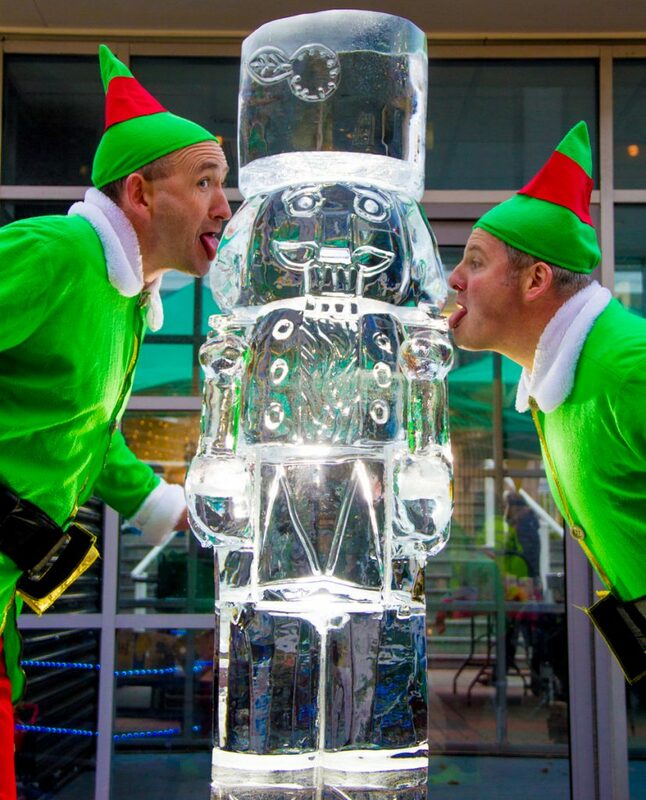 Even St Johns got in on the ice sculpture fun! Christmas ice sculpture. 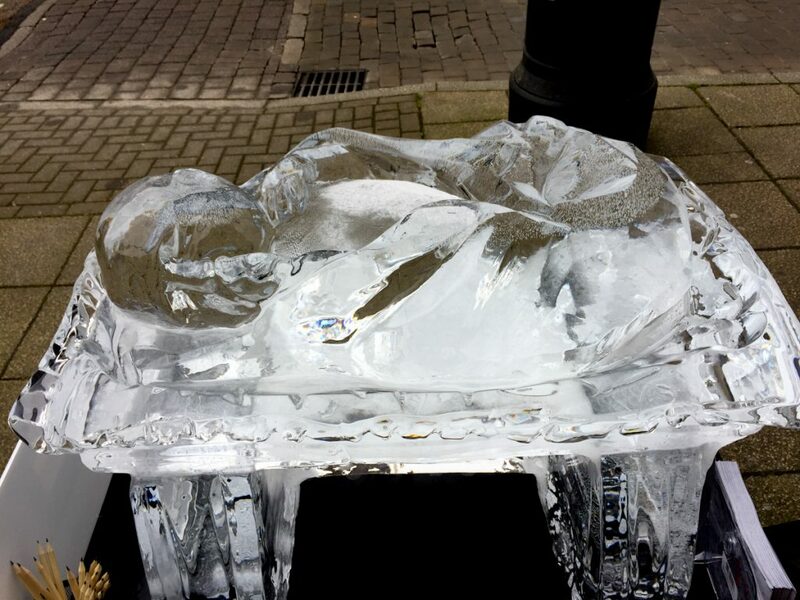 Away in a manger.